The National Memorial Gordon Boys' Home was founded in July 1885, at the suggestion of the Prince of Wales, to commemorate General Charles George Gordon who had recently died in the siege of Khartoum. Several boys' homes bearing the General's name that were opened at around this time (e.g. Dover, Croydon) but the National Gordon Boys' Home, whose supporters included Queen Victoria, was the largest. An already established scheme, the Gordon Boys' Camp, agreed to merge its resources with the National Memorial Home scheme. In October 1885, while its permanent premises were under construction at West End, to the west of Chobham, near Woking in Surrey, the Home began operating in temporary premises at Fort Wallington, near Fareham in Hampshire, one of a line of forts constructed in the 1860s on Portsdown Hill. Just over two years later, on December 14th, 1887, the new building was ready to occupy and the 100 or so boys by now in residence at Fort Wallington travelled by train to Brookwood station then marched to the West End site, led by their newly formed band. 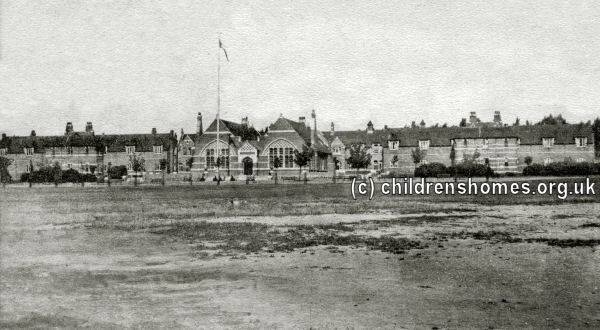 The new location, on Bagshot Road, West End, could accommodate 240 boys, aged from 14 to 16 at the time of admission, who were required to be 'necessitous boys unconvicted of crime and free from physical infirmity'. Some boys were admitted free, while others were required to contribute an annual payment of up to £22 according to their circumstances. Applicants were required to provide a recommendation and certificate of character signed by a clergyman or magistrate. Boys left the institution on reaching the age of 18. The location of the home is shown on the 1915 map below. 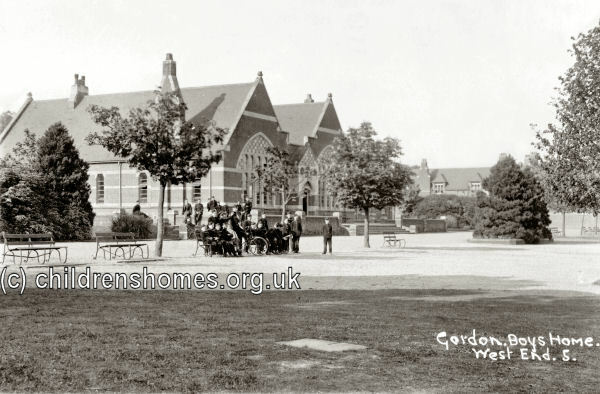 National Memorial Gordon Boys' Home site, Woking, c.1915. The home was run very much along military lines with drill and marching. Army-style bugle calls were used to call the boys to parade, meals, collection of post etc. Boys were also assigned army ranks such as Corporal, Lieutenant Corporal, Sergeant and Colour Sergeant. 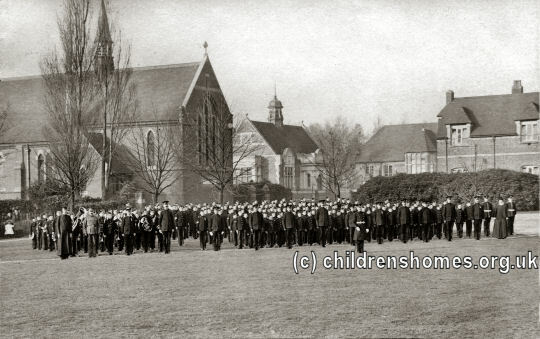 On admission, boys were supplied with a complete kit including uniform, boots, underclothing, etc. 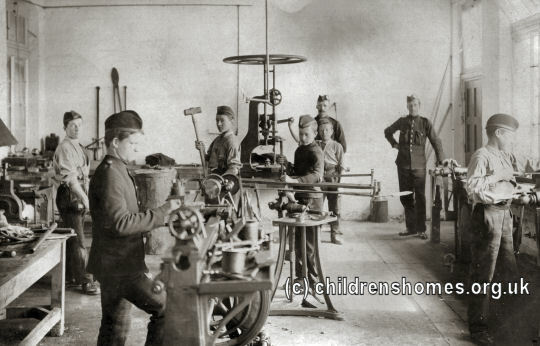 As well as school lessons, the boys were instructed in trades such as shoe making, tailoring, carpentry, metal-working, saddlery, agricultural work and baking. They also received training in plan-drawing and telegraphy. The boys made all their own clothes and boots, carried out all the carpentry repairs needed in the home, baked all the bread, cultivated most of the vegetables used, did the cooking, laundry work and repairs of clothes. For boys with a musical inclination, there was a drum and fife band. A press report in 1890 gave a picture of life at the home. The situation of the Home may he described as three miles from anywhere, sad five miles tram Woking. It lies on a breezy plain 2¾ miles from Bagshot mad four from Sunningdale, the nearest telegraph office being at Chobham, two miles away. At last we stopped at a long and not unpicturesque range of buildings in red brick, over which the Union Jack proudly floated, and I knew that I had reached the Home. Major-General Tyndall, C.B., of the Bengal Staff Corps, who is the Commandant (for the Home is under military discipline like a fort) happened to be absent, but I was most courteously and cordially welcomed by the genial staff officer, Major George Collins. That the task of government is no sinecure may be gathered from the announcement that there are at present in the Home 182 boys between fourteen and eighteen years of age, whose only qualifications for admission have been destitution and absence of such physical infirmity as would disqualify them from an active career. Bearing in mind the belligerent qualities which are so strongly developed in the healthy street-arab, it speaks worlds for the discipline of the Home when we hear that quarrelling and fighting are an unknown quantity there. A happier-looking lot of youngsters it would, indeed, he hard to find. In their neat blue-cord undress uniforms they were thronging about the great quadrangle at the Home, and I saw them go through all their daily routine. With the accuracy of regulars they performed the evolutions of drill, physical exercises with and without arms, and the new bayonet exercise. Then a full fife and drum hand, thirty-six strong in the regulation form of the Home — which is similar to the undress uniform of the Engineers; a dark blue tunic with Gordon tartan trews and a Glengarry cap bearing the Gordon badge — marched and played for my benefit a popular air and a Scotch march in a manner which would have done credit to the Grenadiers. The whole tone of the place is brisk and military. All the sergeant-instructors are soldiers, and every boy in the place carries himself like a man. I am not surprised to learn that no less than sixty-two of the lads had passed from the Home to the army, and that the army is continually asking for more. No compulsion is put upon their choice of a profession, any more than upon their form of religion, but almost every boy who succeeds in stretching himself to the required dimensions elects to go into the army. To bring the boys after their neglected early life to the military standard of physique is one of the difficulties of the case. Cubits cannot be added to stature, but smoking is strictly prohibited, so that that vice, at any rate, shall not check growth; and the gymnasium recently established has added as much as two inches and a half in two months to a chest measurement. Everything that can be made on the premises is manufactured by the boys in their own workshops, under the tuition of sergeant-instructors. Up to the third standard continuous school is the rule, but after that one-third are at their lessons while two-thirds are at work. I was shown by the major round all the workshops — the tailoring, where all the clothing save the caps and socks are made; the shoemaking, where all the boots are made; the carpentering and the bakery, the smithy and the laundry; and in each the boys were hard at work, and enjoying their occupations like games. In the amusement-room they were busy, and in the schoolroom equally so, and with similar zest. The little colony at Chobham, with its 200 inhabitants, its territory of 48 acres, mainly waste land as yet, and its benevolent martial law teaches a valuable lesson in political economics! No effort is spared to make and maintain an esprit de corps in the Home. When the boys go out for their Saturday half-holiday, they do so in full uniform. They are taught to regard themselves, the "Gordon boys," as superior therein to any other boy whatsoever; and when they leave the Home, connection is kept up with them by correspondence. It is the same in the internal working of the place. A corporal and lance-corporal are selected from each dormitory, or squad of twenty; monitors are appointed in school; end an admirable system of half-yearly good-conduct badges is in force. Each of these distinctions carries with it an increase of pocket money over the normal fourpence a month. One little man I interviewed had gained the utmost possible in good conduct badges — he has five red stripes on his sleeve — and was the wearer of a silver medal, a unique distinction in the Home. This system works so well that in the whole four years of the Home only one boy, an incorrigible specimen, has had to be expelled, while 332 have entered. Corporal punishment, which is stringently forbidden to he administered except in the presence and by order of either the Commandant or the Staff Officer, has become a mere name. The machinery of the Home works with all the ease and regularity of a chronometer, and I defy the most persistent critic to find one flaw in the system of management. From the great dining-hall, with its lavish bill of fare to the swimming bath, from the admirably appointed gymnasium to the cosy hospital under the matronly charge of its cheery Nightingale norm — every department defies improvement. The home was later renamed the Gordon Boys' School. With the admission of girls in 1990, it became simply Gordon's School.